After the summer school in July, fieldworkers in Jordan (29/30 September) and Lebanon (22 October and 18/19 November) started their training sessions with an evaluation meeting about last year’s experiences and challenges. Together with Ayman Abdul Majeed (Birzeit), the colleagues in Jordan discussed adjustments of their research proposals, varieties of research methods (oral history, biographical interviews, research through social media platforms and focus group interviews) and their plans for their pilot study. 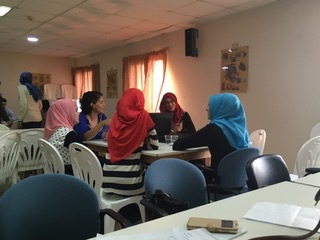 In Lebanon, the trainees already started to review the first drafts of their research papers collectively. 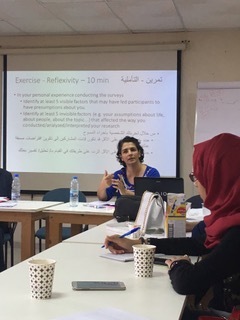 The trainer’s team could gain the support of Dr. Perla Issa, Dr. Amro Sadeldeen and Dr. Maher Charif from the reserach unit of the Institute for Palestine Studies in Beirut. They shed light on the specifics of qualitative research, especially emphasizing the importance of ethical considerations and reflexivity during different phases of a research project. Om the coming months, the trainees will re-articulate their research questions and conduct the second round of fieldwork.